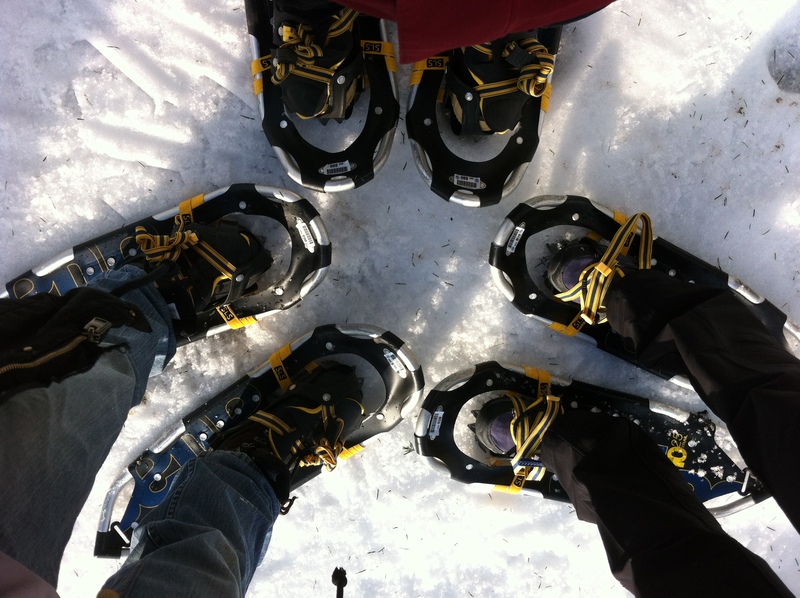 Kari’s picture of the three us wearing modern snowshoes. One of the reasons I decided to go with friends to Quebec (see last week’s adventure blog), in January no less, was one word: snowshoeing. It’s one of those experience-nature things I think so many of us, in the South anyway, grew up seeing on TV. As a big nature buff, I’ve always wanted to try. Of course, I then mentioned it to my seven office mates, and as four of them had grown up in Canada or in the northern United States, they were less than impressed that this was an adventure. “It’s hard work.” But for me – yes, it was definitely something new, and my friends, Kari and Juliet, and I looked forward to it. Snowshoeing was on our last day in Canada, via a beginner’s class at Montmorency Falls Park. We were a little worried that the class would be cancelled, because there had been freezing rain the day before, and we thought the snow may be more ice than snow. But it turned into a sunny, beautiful day, at just the right temperature to keep us cool as we snowshoed by the river, through woods filled with 1-3’ deep snow that crunched satisfactorily as we walked. The modern aluminum and rubber snowshoes were awkward at first, and occasionally one of us would step on another’s snowshoes, or on our own, but they weren’t as wide as expected, or as heavy. You still had to walk a bit bow-legged, but I got the hang of it, and I could have hiked quite a while longer than the 1 ½ hrs we were out there. 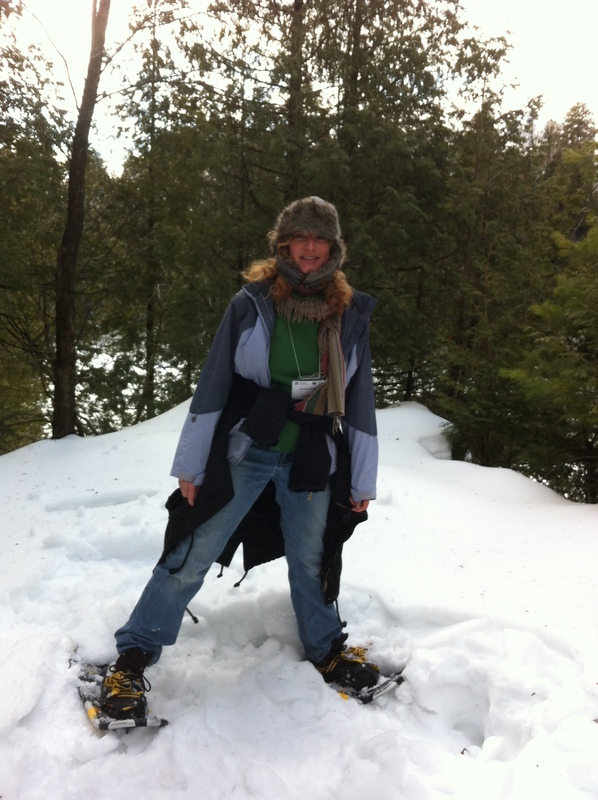 My feet did feel wonderfully light, however, once I took the snowshoes off. Unfortunately, my camera’s battery was dead, but Kari sent me a picture I can use as proof that 1) I snowshoed, and 2) I didn’t freeze in the process. 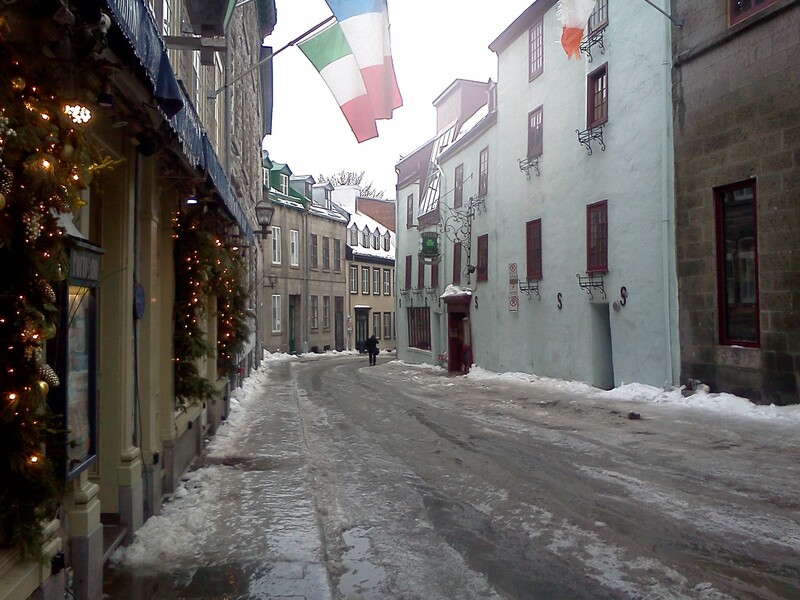 It was actually a warmer day that day, compared to the day before – us walking through Quebec City after a bout of the freezing rain. P.S. 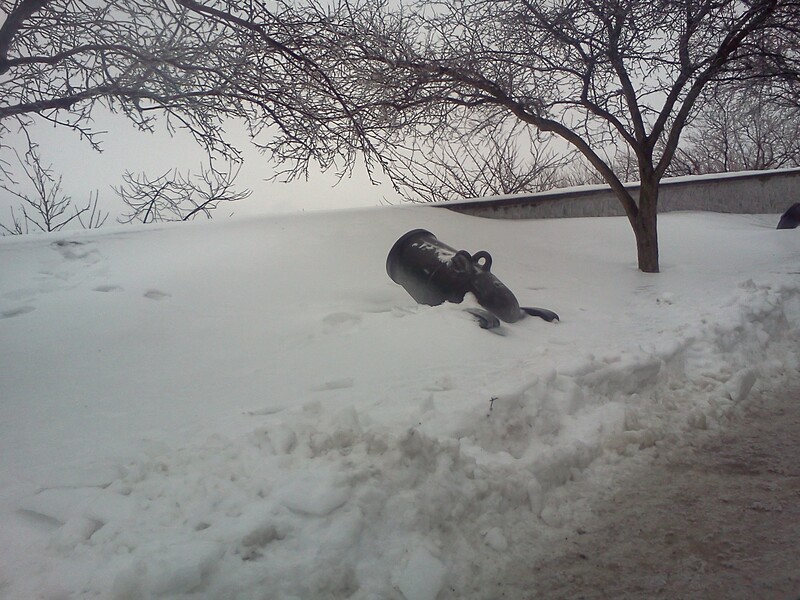 I had said last post that obviously Canadians know how to handle the cold. But as Juliet pointed out, nobody shoveled the sidewalks. Everywhere we went, there was snow or a sheet of ice on the sidewalks, even if worn down by footprints, or sprinkled with sand. In DC, one is fined if you don’t shovel you walks within ~12 hours after a snow. 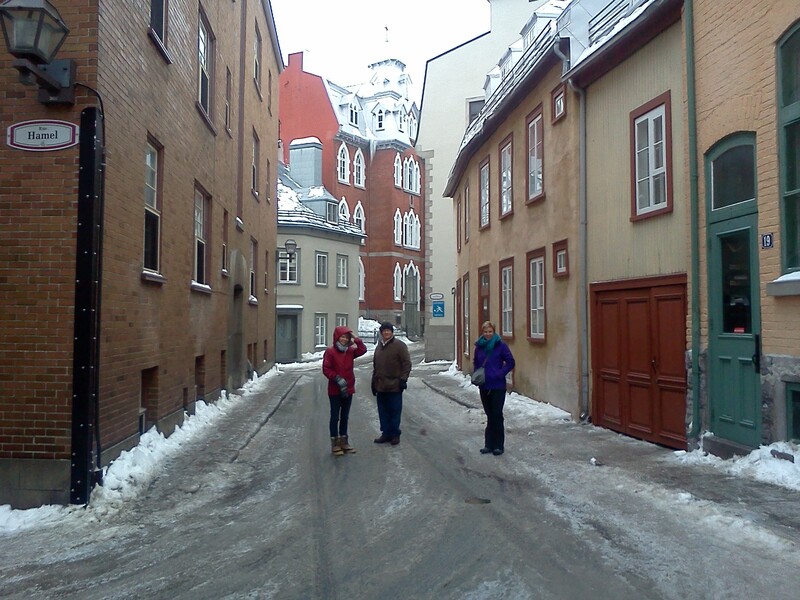 Here, we were amazed that no business shoveled the walks or the steps in front (I saw one sprinkle what looked like salt) – think of the liability! (Yes, we Americans are now mentally trained that way!). Finally, the last night we were there, we saw a mini city snowplow speed up and down the sidewalks. Unfortunately, it only took off the top layers, leaving enough to freeze by morning and create a slick, dangerous surface. A final snow/ice-scraping would have done wonders. As part of the fight against cold, furs were obvious. I haven’t seen furs in years in DC, but, obviously, there are different attitudes towards animals in Canada than I am used to. Pate, calf sweetbread, and tons of meat were main menu items. I personally feel that IF you are already using an animal for meat (which I haven’t needed to do in 20 years), then utilizing their fur is useful. But there were many fur stores in Quebec, including many ones with hats where a fox’s cute little head was actually centered on the hat. I grew very disheartened, as foxes are such intelligent creatures. It’s so sad, because very few people would actually wear such a hat – the fox would have died only for a novelty buy (the meat may be used for pet food). Note #2: I as a vegetarian survived this trip. The cream of carrot, the cream of tomato, the cream of broccoli, and the cream of zucchini soups were all great. I got tired of eating salads after a while (this vegetarian is actually not a salad fan). I also had potatoes, beans (without meat), and burnt pizza. But one very nice night, I had excellent fresh tomato pasta at a great Italian restaurant and all was well with the world. 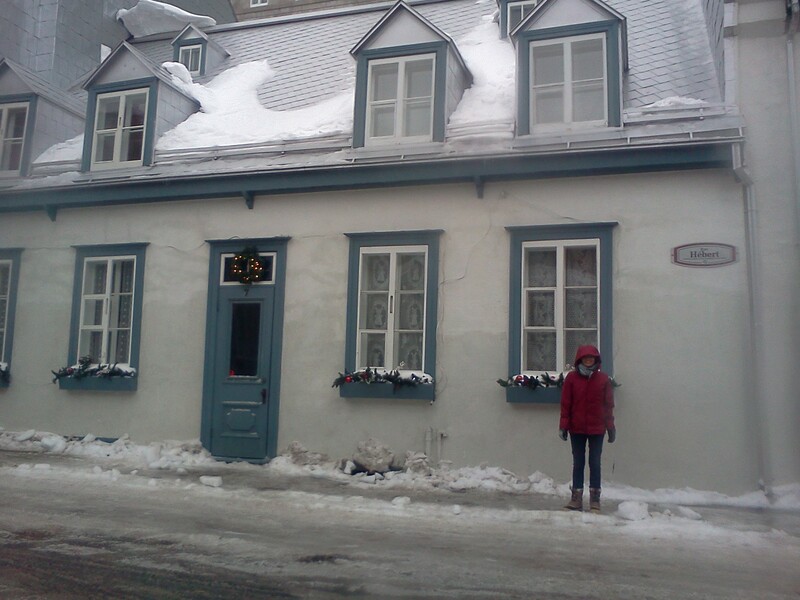 So that’s it on the Quebec trip! Now to come up with something easy for next week, considering how much laundry I have brought back….